Jacob “Jackie Burke” Berkowitz is a former TV star of Eddie’s Home, but now he does small shows as a standup comic. Even though his TV days are over, fans often call or chant “Eddie”. He wants to separate from his past persona and be a respected comic, but when a heckler goes too far for his webisode, “Standup Takedown”, Jackie loses it. He originally gets community service and a fine. But then Jackie doesn’t apologize, in a matter that the plantiff likes, he gets 30 days in jail. Once out, Jackie learns from his manager, Miller, that he is viral and people are scared to hire him. During his community service, Jackie meets Harmony. Harmony – recently dumped – is serving community service too. Harmony and Jackie connect. Jackie asks Harmony to attend his niece’s wedding. Harmony asks Jackie to meet her father, Mac. Mac is an “Eddie” fan and Harmony thinks meeting Jack would be a great birthday gift. Jackie is happy to find a woman as open and raw as he is, but when Harmony tells him she is moving to Florida, he is hurt. He has to stay to finish his community service and rebuild his career. With big obstacles in their way, they must find their way back to each other and both need to find peace. Mheh! Even with several heavy hitter performing stand up routines, this comedy is just ok. The comedy is crude and rude but worth a few chuckles and “oohhhs”. 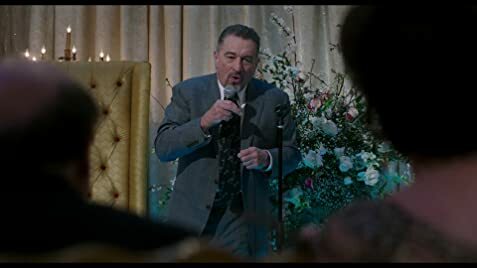 DeNiro tries to put on a strong performance but with a sad script. Leslie Mann plays the same role she always does … so nothing special there. This movie felt too long and the comedy is just average. The “Jackie” and “Harmony” characters don’t make a true transition in life by the end of the movie. Just wait for Redbox.